When I was little, I was super into pro wrestling. Plenty of superstars stuck in my mind, and quite literally one of the biggest was the late, great André the Giant. While he was a pro wrestling superstar, many also know him from his role as Fezzik in the film Princess Bride. When I saw that Antediluvian Miniatures was releasing a pack of pirates with some very familiar character, I didn’t hesitate to pick them up. It’s great to be able to sort of pay tribute to a childhood hero. It’s a lovely, lovely sculpt and a great likeness. 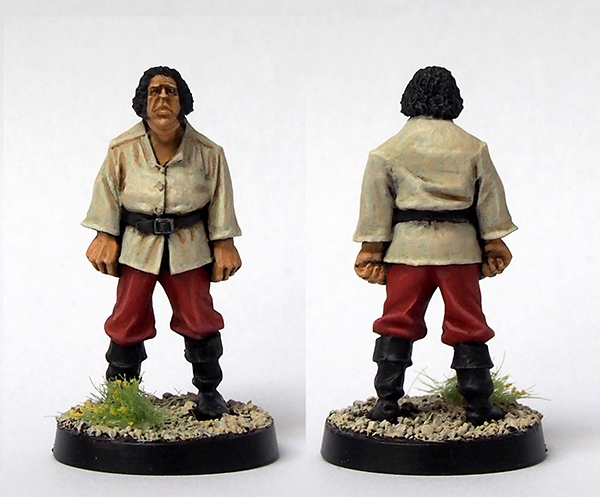 In keeping with the subject matter, he stands head and shoulders over regular 28mm minis. I kept the palette very simple and muted to suggest an unassuming personality, and I think the end result is pretty fitting. The base colour for the pants is Reaper Miniatures’ Master Series HD Rusty Red, and the reason I’m mentioning it is because it’s an awesome paint. Plenty of pigment, great coverage and it’s a lovely shade of…well, rusty red. In my Port George narrative, Big André is the town’s heavy lifter and odd job man, breaking up fights as a tavern bouncer, hauling crates aboard ships and carrying logwood. While both the various pirate captains and the Port George well-to-do have tried to recruit him as a bodyguard, Big André prefers a modest life of peaceful propriety. 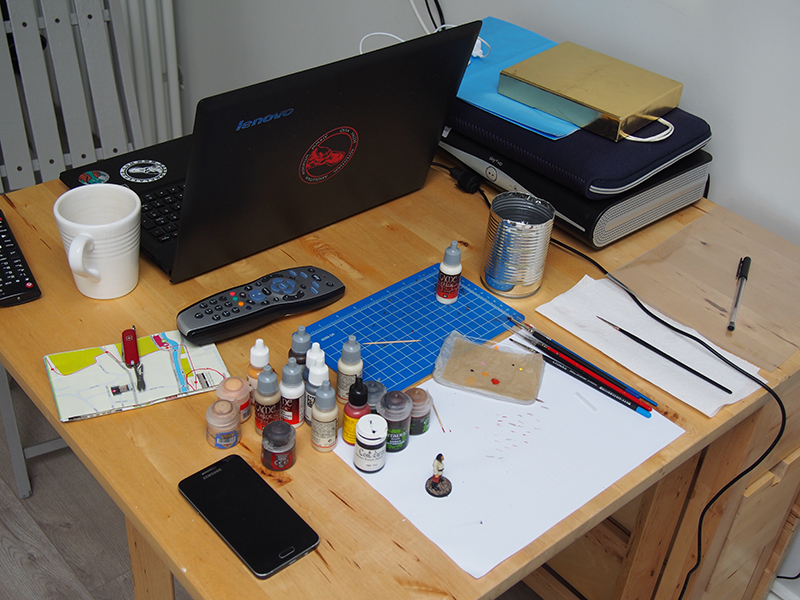 We’re settling in Dublin, and I’ve finally set up the limited painting gear I brought along. Note the street-credible water pot I made from a food tin! Thanks IRO! Was a big fan too, sad to see him go. Cheers Alex! Should maybe watch some classic WWF today just for nostalgia’s sake. That’s a great rendition of a wonderful character and an inspiring actor. 🙂 Well done! Thanks symphonicpoet! Happy that I could do him justice. The sculpt really is excellent isnt it? The painting is nice too, uncomplicated, just right for the character. Is that the first miniature that you have painted on foreign soil? It is (to both questions)! Kind of like the first baby born in a colony. Thanks for the compliment too, it was fun painting something really simple in the way of paint schemes.